Tennyson Beach-house is an informal, light-filled dwelling that exploits its beachfront location, whilst achieving retreat from beach-walkers and weather. Living and work areas - inside and out - (with appropriate sunscreening) are oriented for western sea views, but also connect with the morning sun, and a sheltered, private northern outdoor space complete with pool. "It is a place for a person retired from professional life, but with a huge appetite for digitally engaging with community and the global village - and keeping fit, beachside. It is designed for the extended-family to stay, without imposing". 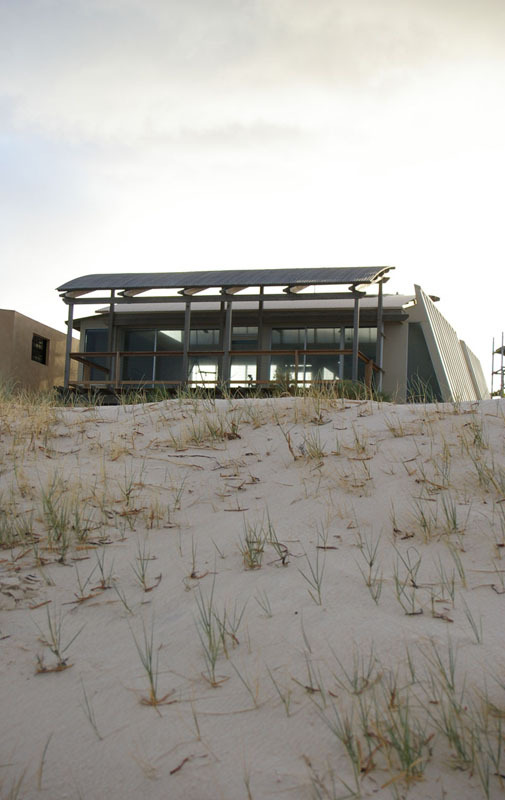 "The beach-house is planned around a sense of ‘dune-journey’, a means of working with natural site-levels". To the street, the house teases passersby beyond slatted screens and translucent materials. On entry, along the retained dune journey, site planning, the house itself, and sea-views open up. The design seeks to engage creatively with ‘beach’. It engages notions such as ship’s bridge/ crow’s nest/ retreat/ shelter/ dune/ sand/ driftwood/ informality/ family/ fun. "The material palette responds to dunal colour-tones, bridges between diverse textures of neighbouring buildings, and accords to ESD-principles. Already natural materials are softening nicely". 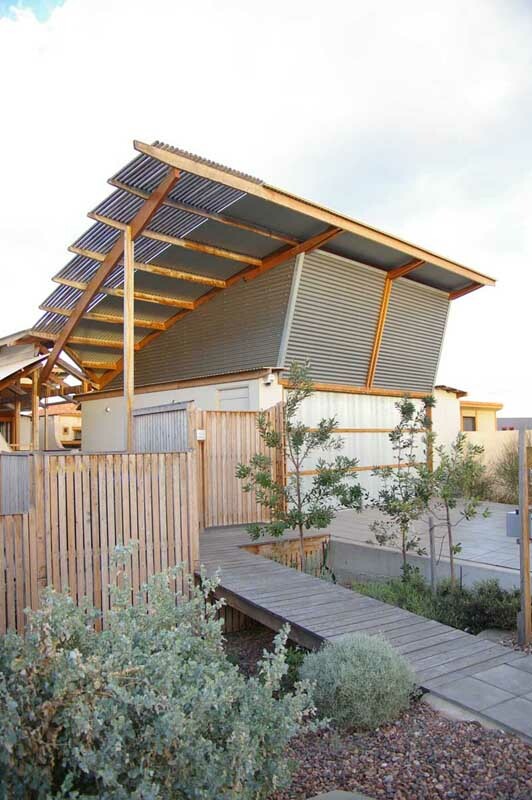 Solar-passive-design, despite accommodating western/eastern view prospects, includes appropriately for northern orientation; and there is accommodation for cross and convective ventilation.